11:35 I'm going to quit for the day; The juice is gone, and so is my stamina; thanks for coming. Take some courses. 11:28 if you look at the SPSunMoonMer chart you can see flux lines and timeline interacting to form this converging triangle. All price movement can be tracked down to a PHYSICAL cause if you have the tools, training, and talent. 11:14 back for a bit-did get a reversal at the first Tide Time. A reasonable sell would have been about 2080. Given the inside day and the behavior of the rally a 3 or 4 point target would be reasonable. 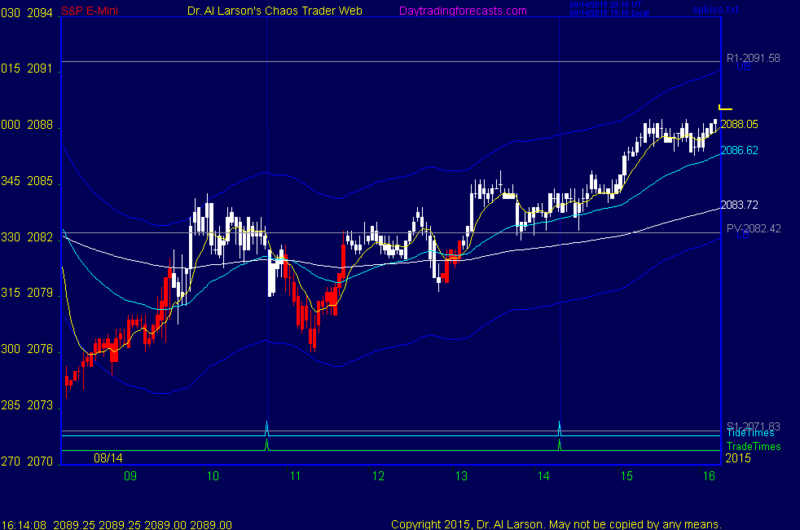 is trying to isolate the fewest number of flux lines one needs to use for day trading the eMini. as well as the SPKiss chart. I trade the invisible electric energy fields, so having good tools really helps. An additional tool is the electric field flux lines, which we are working to bring to NinjaTrader soon. 8/14/2015 8:50:10 AM MT Al****:: reversals versus continuations depend on several things. First, the speed of the 110 and 200 EXMAs tells you how stong a trend is. If the 110 is moving more than about 2 to 3 points per hour, you will see good continuation trades. Slower than that, Tide times are more likely to be reversals. 8/14/2015 8:26:22 AM MT DPP****:: Hi Al; Thanks for teaching on Friday's; Can you elaborate on how you use trading rules / guidelines for continuation vs. reversal trades at your trade times? Thanks.